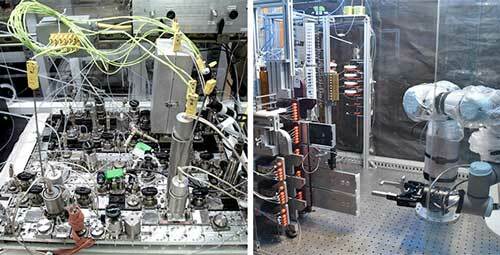 (Nanowerk News) Chemical innovation plays a key role in developing cutting-edge technologies for the military. Research chemists design and synthesize new molecules that could enable a slew of next-generation military products, such as novel propellants for spacecraft engines; new pharmaceuticals and medicines for troops in the field; lighter and longer-lasting batteries and fuel cells; advanced adhesives, coatings and paints; and less expensive explosives that are safer to handle. The problem, however, is that existing molecule design and production methods rely primarily on experts’ intuition in a laborious, trial-and-error research process. DARPA’s Make-It program, currently in year three of a four-year effort, is developing software tools based on machine learning and expert-encoded rules to recommend synthetic routes (i.e., the “recipe” to make a particular molecule) optimized for factors such as cost, time, safety, or waste reduction. The program seeks to free chemists so that they may focus their energy on chemical innovation, rather than testing various molecular synthesis pathways. The program also is developing automated devices that uniformly and reproducibly create the desired chemical based on the software-generated recipe – this one-device, many-molecules concept is a departure from the traditional dedicated reactors in chemical production. Make-It research teams have recently demonstrated significant progress toward fully automated rapid molecule production, which could speed the pace of chemical discovery for a range of defense products and applications. Left Image: Overhead view of a reconfigurable chemical reactor built by SRI International. Chemicals pass through different types of reactors using tubing inside the apparatus. By changing the configuration of valves on the system, over 500 different pathways are possible on this single, tabletop device (SRI International Photo). Right Image: Automated chemical synthesizer built by MIT researchers. Chemicals flow into the vertically stacked cartridges, which serve as chemical reactors. These can be inserted, reordered, or removed by the robotic arm to perform computer-designed syntheses (MIT Photo). Biologists needing molecules for their research would be able to produce them on-demand in custom-sized quantities rather than buying molecules in bulk from a chemical supplier and disposing the excess, Fischer said. One could imagine similar gains across many technological areas – anywhere small molecules are needed for research and development could benefit. A major benefit of automated chemical synthesis is that it creates reproducible procedures, which democratizes and accelerates production. A drawback with existing non-automated approaches is that seemingly negligible changes – e.g., how fast a reaction is stirred or slightly different temperature conditions – can have a big impact on the purity and yield of the chemicals produced. This leads to lab-to-lab variability and difficulty reproducing prior-reported syntheses. Additionally, automation provides a safer, cleaner, and more secure process since chemists do not need to physically handle dangerous chemicals, such as those used to develop new explosives for the military. Make-It synthesis machines require low solvent volumes, which results in less lab waste. Make-It is achieving success due to its multidisciplinary focus with a talented group of researchers, combining computer science, organic chemistry, and chemical engineering expertise to address three areas: automated molecule design; automated synthesis, or production; and rapid reaction screening. The Massachusetts Institute of Technology (MIT), SRI International, and Grzybowski Scientific Inventions (GSI) are exploring different approaches for developing software to automatically design various chemical route options. GSI’s molecular route optimization software is now commercially available. MIT and SRI are also developing hardware to synthesize molecules. The University of Glasgow is developing software to design and 3-D print small, portable reactors to provide manufacturing of specific molecules “on-the-go.” Such disposable or recyclable reactors could enable much lower cost synthesis of high value, niche-area products, particularly in austere locations. In the rapid reaction screening focus area, Purdue University and Boston University are exploring methods to build, understand, and utilize large data sets of chemical reactions to train machine-learning algorithms so they can quickly design novel molecule pathways. Next steps in the program include integrating real-time characterization of the synthesis process through analytical instrumentation and developing more complex molecules. DARPA Make-It researchers will present their results during a special session at the American Chemical Society’s National Meeting & Expo in Boston, Massachusetts, Aug. 19-23, 2018.